Graphene electrodes are promising candidates to improve reproducibility and stability in molecular electronics through new electrode–molecule anchoring strategies. 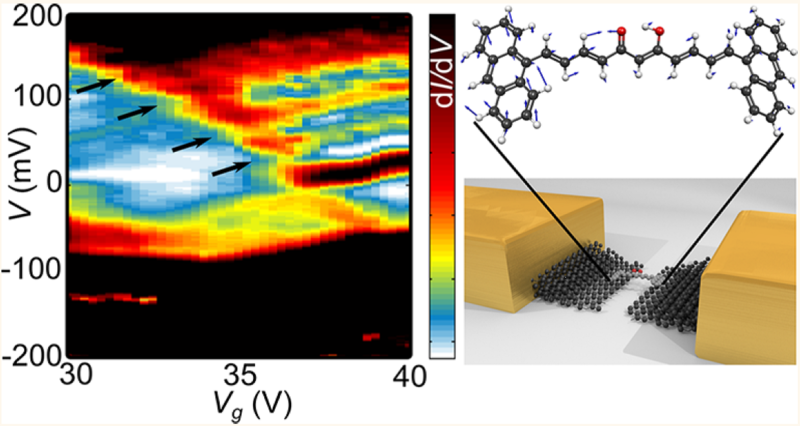 Here we report sequential electron transport in few-layer graphene transistors containing individual curcuminoid-based molecules anchored to the electrodes via π–π orbital bonding. We show the coexistence of inelastic co-tunneling excitations with single-electron transport physics due to an intermediate molecule–electrode coupling; we argue that an intermediate electron–phonon coupling is the origin of these vibrational-assisted excitations. These experimental observations are complemented with density functional theory calculations to model electron transport and the interaction between electrons and vibrational modes of the curcuminoid molecule. We find that the calculated vibrational modes of the molecule are in agreement with the experimentally observed excitations.